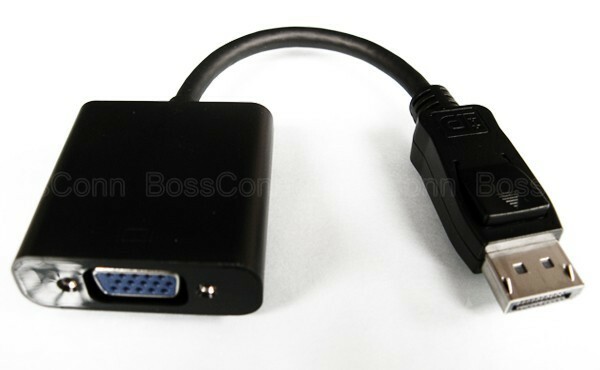 DisplayPort to VGA Female Adapter, Cable. Connect your Apple MacBook to HDTV or projector for large screen display. DisplayPort 1.1a compliant receiver offering 1.62 and 2.7Gbps over 4 lanes. Video resolution up to 1920 X 1200 X 60Hz. ESD protect: Human body mode at 8 kV, Machine Mode at 400 V and Charging device mode at 2 kV. Cable Assembly type: Assembled with plastic cover. Chip is located on VGA end. Color: Both black and white color are available. RoHS, FCC & CE compliant.